A couple of outstanding uniform combinations, a couple of special helmets and a jacket you have to see to believe, let’s take time to acknowledge some of the better looks from this weekend. I’m back. I’ve missed the last few weeks after over-stretching myself commitment-wise, but felt the need to offer at least a uniform commentary this week. Since I’ve taken so much time off, another ranking didn’t feel right, so this week we’re just going to highlight the best of the weekend, be it full looks or single items. The Mountaineers may have lost on Saturday, but at least they did it wearing one of my favorite helmets in the Big 12. The throw-back WVU logo on a white helmet is a thing of beauty. Throw in the “Country Roads” on the back with the state of West Virginia in place of the “O” and stick a fork in me I’m done. Seriously, they are so clean and classic. That is a throwback done right. I thought the first version of the Sailor Bear helmet was good. Then the Bears rolled out the Black version against TCU and “ooh boy,” just make this the official Baylor helmet! I love throw backs and this is such a fantastic and unique logo it should never disappear again. The uniform as a whole a pretty solid one, but with that helmet, make sure it’s something that becomes, at worst, an annual tradition. 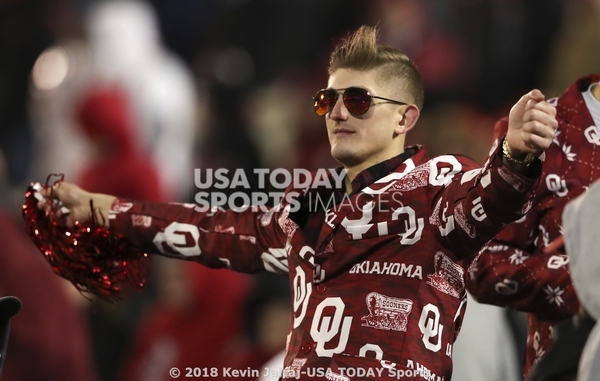 I’m probably alone on an island here, but the combo Kansas wore in their loss to Oklahoma on Saturday is one of the most underrated in the Big 12. That helmet, with KU on one side and the Jayhawk on the other, is perfect. the Blue-White-Blue combination is clean and looks great. It helps that Kansas just has a really pretty shade of blue. The Jayhawks might not put a great product on the field, but at least they look good out there. I’ve ragged on Iowa State’s uniforms pretty hard this season, and frankly for good reason. They’re not great. But I have to admit that the White-White-Red road combo is a pretty solid one. The yellow in everything still makes it a weird kind of flashy, but I like how it matches against the classic Texas home look. It’s far from my favorite look, but worth some props. The frat-boy hair aside, that is one fantastic jacket.